Chase Ultimate Rewards points, which can be earned on cards like the Chase Sapphire Preferred® Card, Chase Sapphire Reserve®, and Ink Business Preferred, are one of my favorite transferable points currencies. I love how easy it is to earn these points thanks to the portfolio of cards accruing Ultimate Rewards points. I also love how unique some of their transfer partners are. Unfortunately as of yesterday Chase lost one of my two favorite transfer partners, Korean Air SkyPass. SkyPass is an incredible program for SkyTeam first class redemptions, and along with World of Hyatt, it was one of my two favorite uses of Ultimate Rewards points. I speculatively transferred over a chunk of points before the partnership ended. Clearly Chase needs to add some new transfer partners, and a while back I speculated about what those partners could be. A new transfer partner has now been added, so at least they’ve done so without skipping a beat. Chase Ultimate Rewards has added JetBlue TrueBlue as a partner. The good news is that Chase Ultimate Rewards points can be converted into JetBlue TrueBlue points at a 1:1 ratio. Amex Membership Rewards and Citi ThankYou points can also be converted into JetBlue TrueBlue points, but the transfer ratio there is 5:4. So kudos to Chase for having the best transfer ratio for JetBlue. I wish they had added a unique transfer partner, but at least if they’re going to add a repetitive one, they’re offering a better ratio than competitors. So if you have the Chase Sapphire Reserve® you’ll almost always get better value by just booking though the Ultimate Rewards portal, rather than transferring points. And then you’d even earn points for your flight purchase, rather than it counting as an award. For example, take a $126 flight between New York and San Francisco. If you wanted to redeem TrueBlue points for the flight, you’d pay 8,300 points plus $5.60 in taxes and fees. Meanwhile if you redeemed directly through Chase you’d pay 8,413 points, and that would include all taxes and fees. In other words, you get a lower price booking directly through Chase, and that doesn’t even factor in the points and elite credits that you’re earning for booking a revenue ticket rather than an award ticket. I’m happy to see that Chase is adding a new transfer partner so quickly after losing Korean Air. However, JetBlue TrueBlue is hardly a replacement for Korean Air SkyPass. 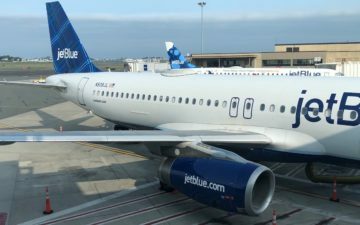 JetBlue is a revenue based program, and given that Ultimate Rewards points can be redeemed for up to 1.5 cents each towards the cost of a travel purchase, there are limited circumstances under which it could make sense to transfer points. What do you make of JetBlue being added as an Ultimate Rewards transfer partner? Any idea the reasons what the business drivers are for ending Korean Air SkyPass? This is great news and makes me extremely happy. I have a few redemptions in mind coming up(almost booked one yesterday but have to hold off for a few days) and while i have a nice stock pile from my JetBlue Plus card and my prior travels, having more is certainly welcome to top off. In fact i just transferred some now to try it out. Quick and instaneous. The 10% back and 6x on taxes and fees will offset whatever possible saving booking through chase at 1.25 cpp will bring. Right. 8413 is lower than 8300. Got it. Love JetBlue but not their ff program. Usefulness of Korean Air is def not matched by JetBlue. What a disappointment. Will still keep Chase Sapphire for now for the 3x categories and rest of the transfer partners. Wondering if they drop Korean Air as that’s the transfer partner they are loosing the most money on? They certainly won’t be loosing money on JetBlue since having them on as a transfer partner or not doesn’t make any difference since JetBlue flights are bookable through chase portal. @Lucky, I think you should comment about how the value changes if you also have the jetBlue Plus card. Meh. Chase removed a great partner and added a very blah one. Anyone super excited about this isn’t thinking straight. I just checked a few flights SEA to JFK, and with the CSR, this is a total bust of a transfer partner. I hope they keep looking for new partners who offer value. In the meantime, United with good Star Alliance access continues to be their strongest, and unique, partner. I love jetBlue but this is laughable considering even before jetBlue was added as a transfer partner, you could purchase tickets through the Ultimate Rewards portal. DUH. I miss those hot Korean Air cabins already. Lucky, I know it only applies to a relatively small number of people, but anyone who has Jet Blue Mosaic state could get some value out of this. By far the best use of Jet Blue points are for using them to upgrade to even more space seats. The upgrades can be as much as $70 and Jet Blue only charges a few thousand points to upgrade, often getting you close to 10¢ a point of value, assuming you value the extra space at face value. Bleh. Jet blue doesn’t even fly to HNL so useless partner for me! @lucky do you think they will add more partners? It makes sense for both of them because they’re saving money by people using points instead of redeeming at 1.5x through the portal… and it doesn’t make sense for both of us, so just don’t do it. @Mark. You are right assuming you’re a mosaic. I think this move by Chase is to reduce their cost of th Ultimate Rewards program. Fewer people are carrying balances than they expected and probably a higher percentage of people are optimizing the use of their points. While there are still some attractive redemptions, I expect them to become fewer are father between. At some point, each point will fall in value to 1.5 cents. Really dissapointing. They need to get an international travel partner – ANA, EVA, Air Canada a program with global reach. Jet Blue is extremely limited and not a good use of Chase points. It just seems Chase doesn’t really care about quality transfer partners. Additionally, they never offered transfer bonuses. It seems Chase is wanting this card to be more of a cash back card for travel redemptions via their portal. Don’t forget JetBlue/TrueBlue points can be redeemed for flights on Hawaiian Airlines, which also flies to a number of destinations in Asia. One of your favorite transferable points currencies, eh? This is a weak partnership. Everyone I know collects points for premium internaltional travel. This will only put more demand on Singapore Airlines. I am willing to pay 500 for a JetBlue mint flight. I however, will not spend 6k on a business class flight to asia. That’s a lot meals,shopping and siteseeing. @ ChiliPalmer and Lucky: You are not factoring in the 378 points you earn by buying a $126 ticket. So that makes the net price through the portal only 8035 points and you don’t pay the $5.60 tax. @Alex Exactly; value changes immensely. The $5.60 in taxes and fees is basically paying that amount for a checked bag when paid for by the JB card. @BR big question — is there a transfer fee? Transferring a chunk of points on Amex to TrueBlur can incur a good deal of points/cash cost just in moving them. Hey nay-sayers, this is a minority report from an expat in Mexico. Granted much of the neg. press here is warranted, but the addition of Jet Blue is a game-changer for anyone looking for access to the mid-atlantic states from here. With the current Oct-Dec sale, there are many dates I can fly any seat, non-stop, day-time, MEX to Kennedy for 4,600 UR points. Huh? That’s ridiculous!!! [the big tax/fee figure is unavoidable on all airlines because of Mexican tourist tax]. And decent seat tilt, footroom and wifi for this 6’4″ guy? I’ll take it! Loss of cheap Korean first class to Asia is no loss at all for this low-roller. Is it true that if you hold biz and personal cc that you get 20% points back? I’d just read that in comments somewhere else. Anyway, that’d change the math a bit to make more sense for transfer, yea?